And...actually it works on all resolutions. Thank you so much, this is by far the easiest widescreen solution. This works brilliant on my new Sony 46 hx800. Many thanks. Call of Duty has 2 executables. CodSP.exe and CoDMP.exe. I don't know for sure, do you also have 2 shortcuts (or is multiplayer launched after loading the Single Player)? Ok, I have modified the program to support Call of Duty. The game launch button only works for single player, but you can press the "Create profile shortcut on Desktop" button, and it will create 2 shortcuts (Single Player and Multiplayer) with the set resolution. my bad, it works thank you so much! the hud is streched but apart from that works very well! Does this apply the proper fov per aspect ratio? ie at 16:9 the fov should be 106.26. FOV has nothing to do with aspect ratio. It is a hack used to see more but with very ugly distortions. The hack is usually used for cheating, and PunkBuster is very restrictive about it. The game aspect ratio has to do with resolution only, and the game will look ok. See screenshot at 16:10 (1680x1050, scaled by Google hosting to 1600x1000). It's hosted by Google, anyone can download. hi, any chance of make this for urban terror 4.1 ? Did you try placing this app in the game folder and running it fromt here? What do you mean "does not seem to work"? Does it crash? Does it not start the game? Did you run this app from the game folder? etc? I got the same problem for the steam version of the game. It doesn't crash, but it doesn't set the specific resolution either. I ran it from within the quake3 folder. I have to say, the steam version is f-ed up however. Thanks anyway. I hope i can get it to 1920x1200 soon. Can't wait to play q3 again. To get it to run into steam, right click on his shortcut, go into properties. 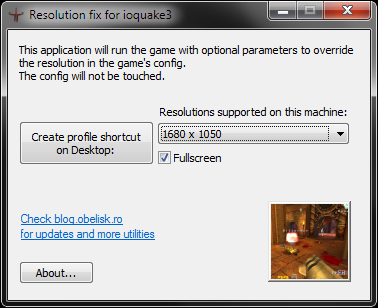 Copy the parameters that he added after the \quake3.exe. 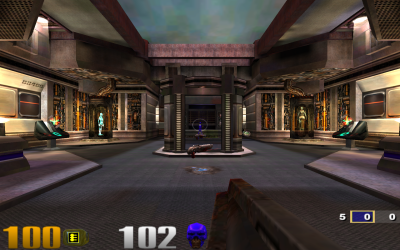 Right click on Quake 3 in your steam library, and go to Properties. Then under the General tab click on the Set Launch Options button. Add the parameters that you copied to the box that pops up.